There’s gold in those reels with the Mayan Gold pokie from Ainsworth having piles of the shiny stuff above, below and all over the symbols. An unusual layout, free spins, multipliers, stacked symbols and Whopper Wilds give this pokiea distinctive style and gameplay, which should appeal to anyone who likes extra features and the fact that it follows a popular theme just adds to the attraction. Based around an ancient Central American civilisation, Mayan Gold reflects the precious metal that was so important to the culture. Above the reels is a big pyramid from which gold coins rain down, while flames flicker, the sun sets and the game title all come together to make an impressive sight. It’s what happens on the reels that’s important however, and the first thing to notice is the layout which sees reels 1 and 2 having 3 rows of symbols, while reels 3, 4 and 5 have their symbols 4 high. The effect of this is that players will be able to line up matching symbols on the first 2 reels quite easily, but it’s a bit more difficult to get a winning line of 3 or more. With 100 paylines, even the reels with 4 symbols on them should see a good number of winning combinations land across them, with players needing 3, 4 or 5 of the same symbol type stopping on adjacent reels running from the left to win anything. There’s the usual 9, 10, J, Q, K and A playing card symbols making up the lower value lines, and while they may be used across most Ainsworth pokies, at least they are colourful. They all have the same value, with lines of 3 being worth 2x the line bet, while 4 pay out 4x and full lines of 5 return 10x the line bet to players. On to the picture symbols now, with various Mayan-themed images adding colour to proceedings and making up the higher-value lines. There’s a flower, green jewel, ornate mask, colourful bird, and most valuable of the lot is a pyramid. This is worth 5x, 20x or 100x the line bet for 3, 4 or 5 of them, but Mayan Gold comes packed with bonus symbols and extra features that they trigger. A couple of wild symbols will be able to substitute for all except the scatter symbol and by acting as others, they can help to complete winning lines. There’s a standard wild that turns up on reels 2 to 5, but players could be in for some big payouts when the Whopper Wild appears. This is a single giant symbol that takes up all of reels 3, 4 and 5, so anyone who has lines of just 2 matching symbols on the first reels will see those lines extend right across them for some 5 of a kind rewards. The scatter is a shiny Dollar symbol and it doesn’t need to land in any particular pattern to be worth 1x the total stake when it stops in 3 positions, 10x when 4 scatters appear and 100x the stake if 5 turn up at once. It will also act as the trigger for 8 free spins, but these are no ordinary spins, as players will see the first 2 reels expanding to 9 rows high, and reels 3, 4 and 5 expanding from 4 rows of symbols to 12 rows. To help ensure that these spins are a more rewarding feature, there’s a Whopper Multiplier that can turn all of the middle reels wild, while also doubling or tripling any winnings that come from it, plus a new Whopper Wild that can turn all of reels 4 and 5 fully wild. A cash rose may not have much to do with ancient Central America, but it’s still a welcome sight in the free games, as whenever it lands on reels 1 or 2, it will turn other symbols into matching ones, which can help complete lines, but any that appear will also stay around for the remaining spins. Any 3 or more scatters will see 5 extra free games added to the end of the current round. 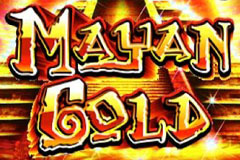 Mayan Gold probably isn’t a game for beginners, as it can be a little tricky to master. Wilds, wild multipliers, Whoppers and cash roses all turn up throughout the game and until players have understood what pays and when, seemingly random wins come from nowhere. Of course, no-one is going to complain about winning a prize even when they aren’t completely sure about why the won it, so spinning the reels of Mayan Gold can still be a worthwhile task for newcomers who like the theme and don’t care about why they are winning.